Selective gastric vagotomy was introduced in 1947 by Jackson1. Modifications of the procedure were suggested by Moore and Franksson2,3. None of these surgeons combined selective gastric vagotomy with a drainage procedure. As a result, the operation was abandoned until Griffith and Harkins demonstrated the need for a drainage procedure, first in animals in 1955, and then in man in 19604,5. Subsequently, the operation was popularized by several surgeons in the treatment of duodenal ulcer. The main benefit claimed for selective gastric vagotomy over truncal vagotomy was a marked decrease in the incidence of episodic postvagotomy diarrhoea. The most significant, prospective, double-blind, randomized clinical trial comparing selective and truncal vagotomy was published by Kennedy et al. in 19736. They showed that patients undergoing selective vagotomy had less postvagotomy diarrhoea, less ulcer recurrence, and superior Visick clinical status. 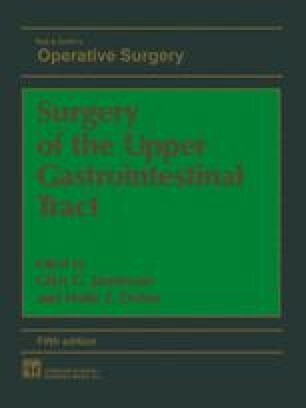 Based on this study and that of Harkins et al.7, the author believes that selective gastric vagotomy is superior to truncal vagotomy in the treatment of duodenal ulcer. The operation takes slightly longer to perform, however, and few surgeons have learnt to do it well. For this reason, it has not attained the same popularity as truncal vagotomy.